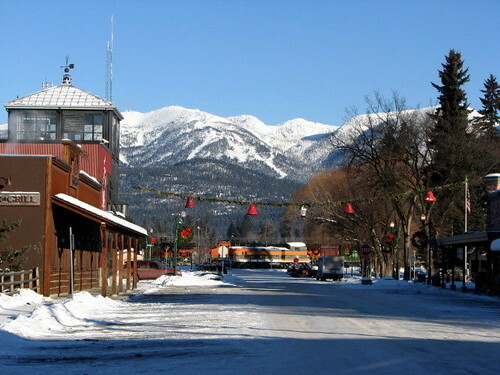 Whitefish, Montana. A surviving relic. What remains today is an odd combination of tourist-catering shops, businesses serving locals (Ace Hardware has an amazingly friendly and knowledgeable staff), as well as restaurants and bars (Buffalo Cafe has an outstanding breakfast and Montana Coffee Traders is a superb Java stop) catering both clientèles. It is a reminder of what Main Street once was across America. A central gathering space and a public commons. Not a privately run shopping mall or quasi-arcade where free speech may be subdued and photographers arrested. Structures, streets and setbacks are built on a human scale, not that of the automobile. Walking the streets it feels instantly comfortable. Building livable communities doesn't require New Urbanism or gated communities. The answers are right in front of us, in our past, in what feels natural. 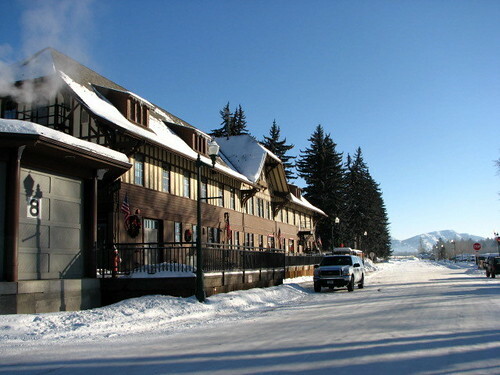 Whitefish remains a livable (albeit expensive) working community. 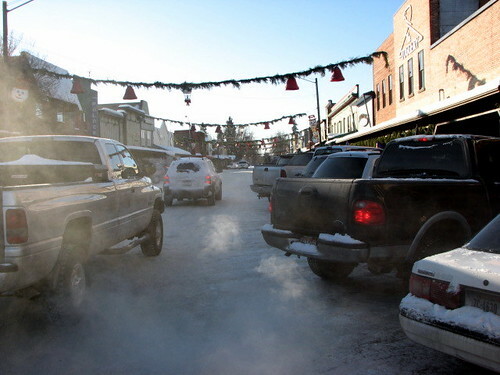 Will the strip malls spreading north from Kalispell ruin her before we appreciate her beauty? 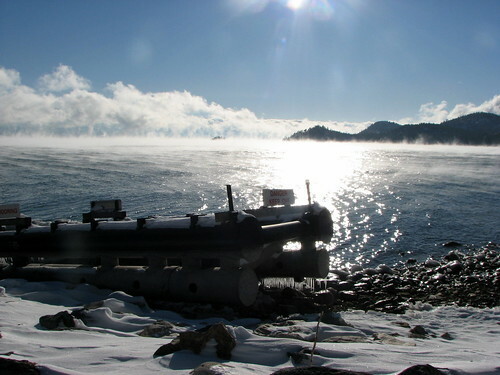 Driving home from Whitefish down Flathead Lake I was treated to a steam fog of incredible magnitude. It was cold. Very, very cold. During the two minutes I was out of my truck to snap photos in the railyard my fingers had frozen to the point of complete numbness. Earlier that morning my truck had started grungingly after a 15 second performance. It was -15 degrees. 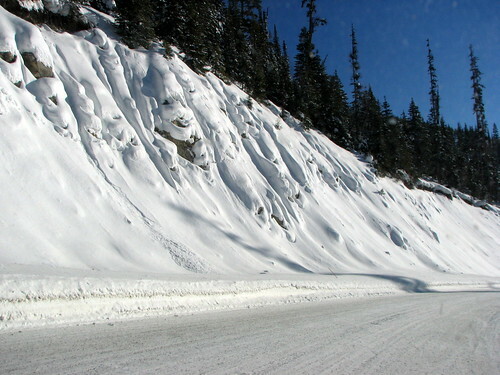 Seeley Lake had reported -38. If I'm not mistaken, I believe spit bounces at that temperature. That's scary cold. 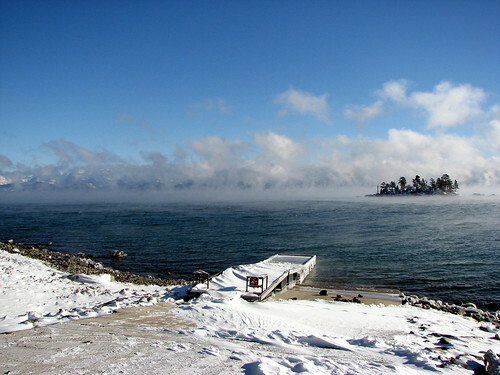 Formed by the injection of more water vapor into nearly almost-saturated air when cold air is advected across a relative warmer water surface. In middle latitudes this is a frequent occurrence over lakes and river during early winter, before the water surfaces freeze. 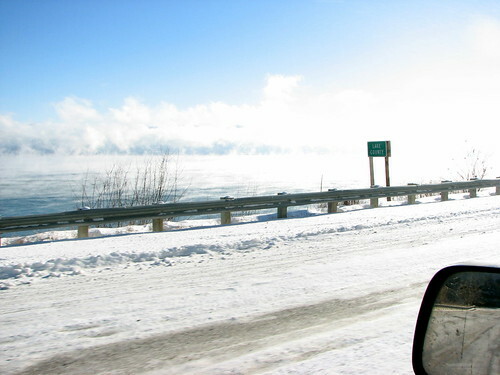 Because the vapor pressure of the cold air above, moisture moves upward from the water surface into the air, even though the air might already be saturated. Almost immediately above the water surface, the water vapor will recondense into liquid water droplets and form fog. Since heat is also being added to the lower air, active turbulence will mix the water droplets upward into the air. 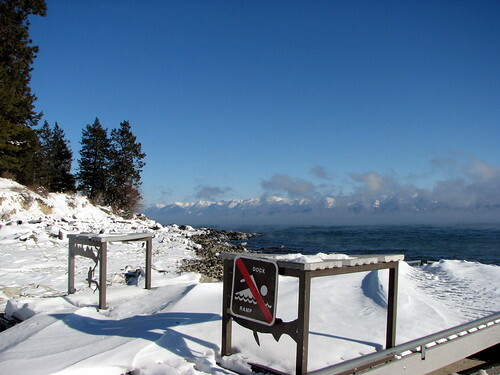 Under such conditions it appears that steam is "boiling up" from the water's surface, hence the name "steam fog." With extreme water-air temperature differences, this sort of fog may take on the appearance of low cumulus clouds based near the surface and extending a hundred meters or more into the air. 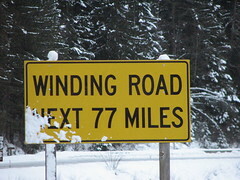 This was the case, as at times the fog stretched completely across US93. Fog stretching out onto US93 at the Lake County line. Some wonderfully whimsical metalwork victim of a very irreverent sign-hanger. My father loves trains, and just being near him I couldn't help but absorb some of this passion. Travel by train in Europe cemented it. I wish that train travel was as easy and affordable here in the States. 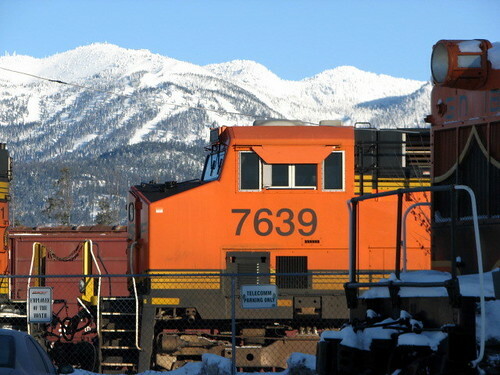 Whitefish is a great rail town. 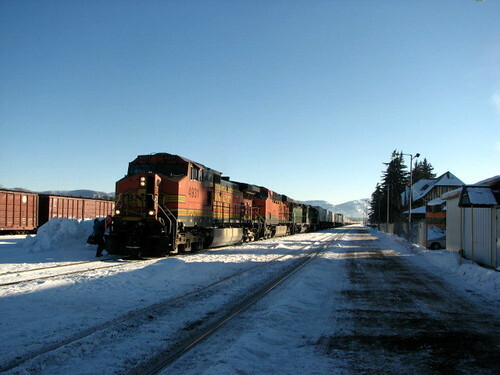 The station is a focal point of downtown, and one diner stays open all night just for the Burlington Northern. I saw the station and within an hour I was on Amtrak's website. 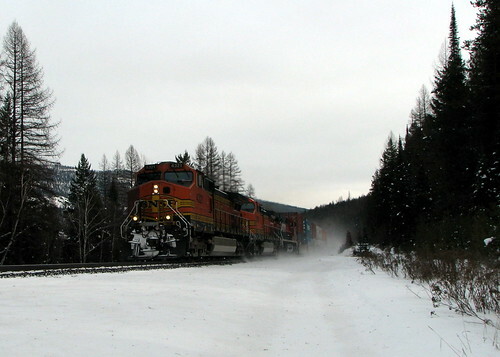 For $149 you can travel from Whitefish to Chicago. It takes 31 hours, but what a fabulous trip! I'm not sure about both legs, but next trip home I think I will have to take the train at least one way. Too bad Boise doesn't have a train any longer. My options closest options are Salt Lake, Portland, Seattle and Whitefish. Of course there is the wonder of Greyhound to get me there. That trip alone will be worth at least three posts. 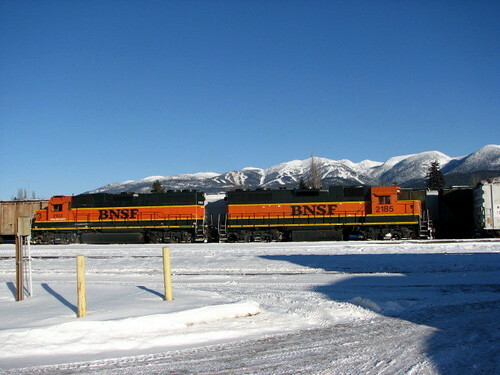 BNSF 2103 & 2185 in front of Big Mountain. Incidentally, the title of this post built on the name of a good Mexican restaurant we discovered in town, Pescado Blanco (Fish White). It was a little pricey for Mexican, but fresh, creative and tasty. Sinuosity Ahead Uploaded by Stupid Dingo. 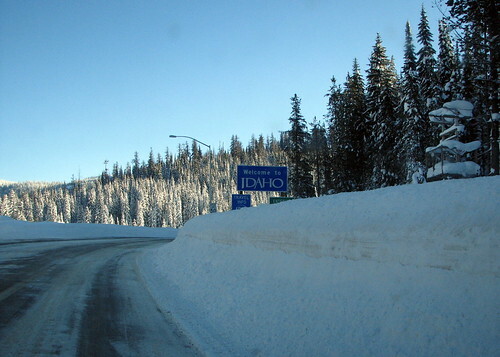 There are no good roads between Boise and Whitefish, but there are a few outstanding ones. A couple of the best options are even paved. 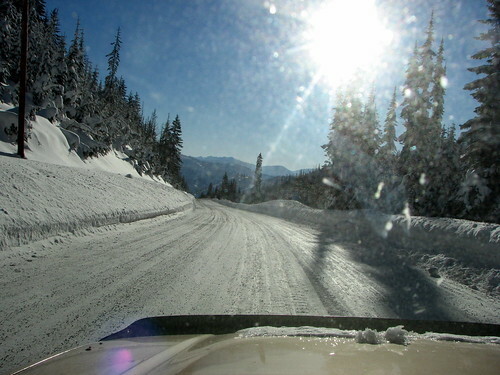 A transportation engineer may disagree but US 12 between Kooksia (koo - ski) and Lolo is a true marvel. I've had the pleasure of driving this route three times so far this winter and while amazed by the beauty, I may have to admit to cursing the route a few times. 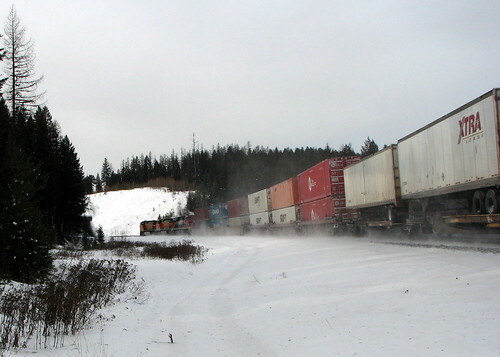 Cursed when in December I found myself stuck in Grangeville, thankfully with two good friends for companions as roads were closed in every direction by blowing snow. And a few expletives may have left my lips as I dodged a few cases of deer on snow covered highways around Syringa and Kooskia. And certainly, late in the evening around Powell... now quite confidently moving at 60mph on the snow covered surface, by this point accustomed to the idea of my truck acting more like a sled than an automobile... when a group of elk decided to stand between me and my destination. Were it not for the previous 70 miles of snow and ice-laden sinuosity I likely would be shopping for a new front end, but US12 had readied me for this all evening and calmly was able to put the truck into a mild drift to the left and hugging the bank the elk too slid to the side and we passed gracefully into the night. Last visible pavement for 80 miles. 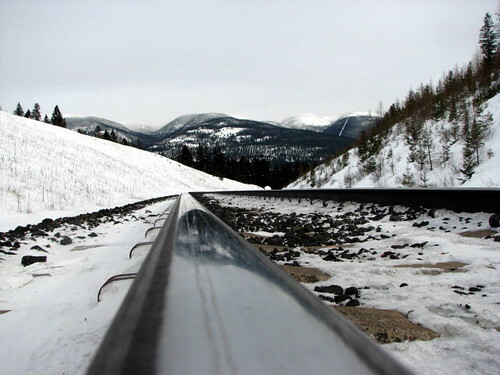 Montana/Idaho border at Lolo Pass. Coming down off Lolo Pass into Idaho. 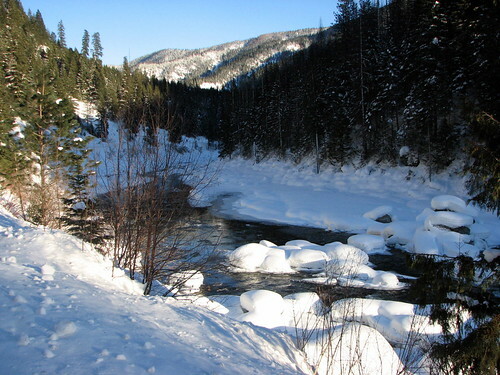 Snow and ice in the Clearwater River.